Fam ily, I recall standing on the top steps of the Benedictine Abbey of Montecassino in Italy. The view down into the valley is breathtaking. We bring our pilgrims there for a visit and tour. We always wanted to make a program on St. Benedict, but could never get permission to do so. However, when we moved to Arkansas, the Lord put us together with Abbot Jerome Kodell of Subiaco Abbey in Arkansas. We became fast friends. He celebrated Mass at the Holy Family Mission often, and we did whatever we could for him at Subiaco. The doors were opened. We were given a guide who took us to every area of the Shrine, including the original tomb of St. Benedict and St. Scholastica. A great deal of these artifacts were underground. Remember, the Abbey at Montecassino was bombed out during World War II. We were taken to places where no pilgrim or tourist is allowed to go. We were told that this Abbey, in its original form, was built by St. Benedict and his followers. Of course, the magnificent structure you see today is a great improvement on the original. We went to Subiaco Abbey, which is just a short distance from Montecassino. It too was built by St. Benedict, but it’s mostly caves. This was the first home of the Benedictines. Upon returning to the United States, we went to Subiaco Abbey in Arkansas, and videotaped Abbot Kodell there. We also videotaped the monks as they sang vespers. There is a school there, elementary and high school. We videotaped the students being taught. It made for a beautiful program. “Saints Maligned, Misunderstood, Mistreated and during the taping of the program on his life, we came in contact with the Benedictine Cross on many occasions. It can be seen at the Shrine of Montecassino. We also noticed it at the Subiaco Abbey in Arkansas. We thought it was the Saint’s cross, like other Saints have. But then we did a little research on it. We went to our favorite resource, Catholic Encyclopedia at newadvent.org. Here’s what they told us. During the life of St. Benedict, while he was living in a cave, when a group of religious came to him and asked him to be their abbot, as their leader had died. Benedict agreed and proceeded to put forth a set of rules, which were basically “Ora et labora” Pray and work. This did not sit well with a good deal of his new monks, and they decided to kill him. They invited him to dinner with them. They poisoned the bread and the wine. 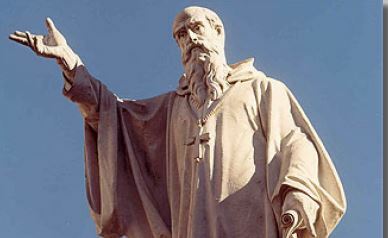 When St. Benedict blessed the bread and wine, he was given the knowledge that they were poison. He dumped the goblet of wine and commanded a raven to take the bread away. This is why the raven is always seen at the feet of the Saint in statues that are carved of him. 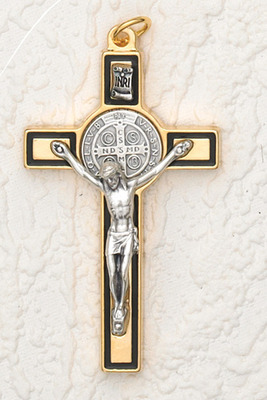 One side of the medal bears an image of St. Benedict, holding a cross in the right hand and the Holy Rule in the left. On the one side of the image is a cup, on the other a raven, and above the cup and the raven are inscribed the words: “Crux Sancti Patris Benedicti” (Cross of the Holy Father Benedict). Round the margin of the medal stands the legend “Ejus in obitu nostro praesentia muniamus” (May we at our death be fortified by his presence). The reverse of the medal bears a cross with the initial letters of the words: “CSSML” (The Holy Cross be my light), written downward on the perpendicular bar; the initial letters of the words, “NDSMD”(Let not the dragon be my guide), on the horizontal bar; and the initial letters of “CSPB” in the angles of the cross. Round the margin stand the initial letters of the distich: “VRSNSMV— SMQLIVB” (Begone, Satan, do not suggest to me thy vanities — evil are the things thou proffers, drink thou thy own poison). At the top of the cross usually stands the word Pax (peace) or the monogram IHS (Jesus). Again, we went to Catholic Encyclopedia and got the following information about the tradition of the Cross of St. Benedict. 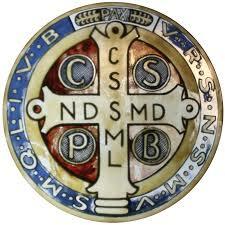 Nobody knows for sure when the actual Medal of St. Benedict originated. However, during a trial for witchcraft at Natternberg near the Abbey of Metten in Bavaria in the year 1647, the accused women testified that they had no power over the Abbey at Metten, which was under the protection of the cross. Upon investigation, a number of painted crosses, surrounded by the letters which are now found on Benedictine medals, were found on the walls of the abbey, but their meaning had been forgotten. Finally, in 1742, Pope Benedict XIV approved a medal to be struck using the image of St. Benedict on the front, and the symbols we mention above on the back. Family, we’re told that the wearing of these medals are great ways to ward off the powers of Hell especially at the hour of death. Penny and I have always had a great devotion to St. Benedict. Any devotion to him would be well worth praying. 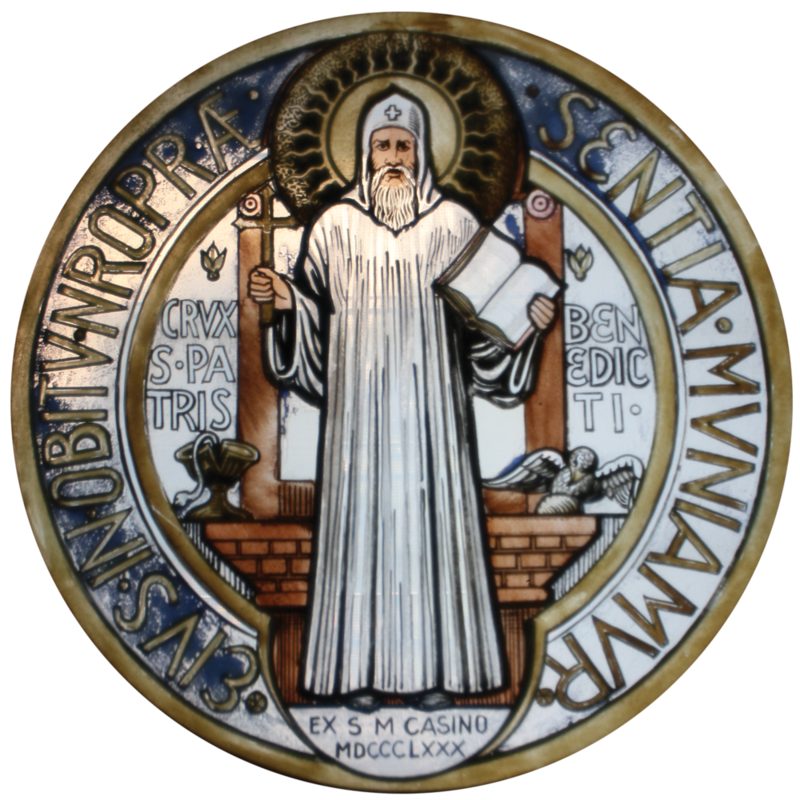 There is a litany to St. Benedict. It’s in the last page of his chapter in our book. Take advantage of all you can. If ever we needed to arm ourselves against the powers of evil, this is it. We love you! Note we ask for your email but we never ever share your information with anyone period. Later on in his life, when St. Thomas Aquinas was in Salerno, finishing the third part of his Summa, which deals with the Passion and the Resurrection, he was kneeling before the Altar in ecstasy. He could feel the overpowering presence of the Lord in the room. He looked up at the Crucifix. It began to glow brightly. Jesus came alive and spoke to Thomas. There is a very special conversation St. Thomas Aquinas had with the Lord, which we have used as a motto for our ministry. At this point, St. Thomas Aquinas went into ecstasy, and levitated. His entire body floated into the air and hovered over the chapel. All the brothers in the convent came into the chapel where he was praying, and beheld him suspended in the air. Toward the end of his life, he ceased working on the Summa Theologica, one of the most famous treatises on the existence of God ever written. We are adding a new free service that we believe you will be excited about. We are taking many of our talks and articles and gathering them together and making them available free. Super Saints clips and more is the link. We will be adding many more in the days to come. You might want to bookmark the page. You are currently browsing the archives for the Super Saint short topics category.